This weekend, the Andover community celebrates the thirtieth annual weekend gathering of the Gender-Sexuality Alliance (G.S.A.). This important milestone merits attention and reflection. The G.S.A. has played a central role in supporting students (and adults, for that matter) of all genders and sexualities on campus at Andover. This week also marks the publication by the New York Times of a memo obtained by the Trump Administration about a proposal to “define out of existence” transgender persons. Regardless of this legal statement issued by the Department of Health and Human Services, we hope that the members of the Andover community will continue to support and love each other, and accept everyone for their unique identities and backgrounds. Andover is a community thoroughly and perpetually committed to diversity, and no announcement or any administration will change that commitment. In the face of these alarming news headlines and government-issued statements, the Andover community must recommit to its values of Non Sibi, compassion, and kindness, and never succumb to the pressures of fear, difference, and hate. And so, in the face of an appalling and nonsensical step backwards in government policy, I’d like to offer my support to all trans, gender non-conforming, and/or nonbinary members of the Media Lab and MIT community. More broadly, I’m calling on leaders of academic communities to speak out on this issue and be very clear that they see, they support, they affirm, and they will protect trans people in their communities. This proposed policy is inconsistent with our belief in not only bringing Youth from Every Quarter to Andover but also in supporting them during their growth, no matter their gender or sexuality. It is also inconsistent with Andover’s Statement of Purpose in which we affirm our commitment to “a deeper awareness of the global community” and our non-discrimination policy affirming that “we do not discriminate on the basis of gender, gender identity, gender expression…and sexual orientation.” We affirm the full humanity and diversity of our students and all those in our adult community. This issue of equal rights for all is not only a matter of federal law and policy. Those who live in Massachusetts have a chance to weigh in on this topic on Election Day — November 6, 2018 — as well. The topic of transgender rights is on the ballot as Question 3. The official description of all ballot questions appears on the Secretary of State’s website. Adolescence is a complicated time no matter who you are. Those young people who are questioning their gender and sexuality deserve support, affirmation, and love, just as all students do. No federal or state policy can change that in our community. The New York Times published a terrific Magazine this Sunday on education. The cover reads: “Teachers just want to teach but the classroom has become a battleground.” I’m not sure that’s exactly “news” this fall but it is absolutely true. Two of the articles in particular were worth reading and reflecting on as we start our new school year. The first, “Can Good Teaching be Taught?” by Sara Mosle, tells the story of a struggling school and its persistent, hard-working first-year principal Cynthia Gunner. The reporter follows Gunner as she goes classroom-to-classroom to inspire, hold accountable, and assist the teachers in her school. The answer to the opening question is “of course” but the finding is also that it’s much easier said than done. It’s hard not to be fired up by the work of this principal and the importance of her efforts. The second that caught my attention was “Watch What You Say,” about the (former?) Friends Seminary teacher Ben Frisch who made a Hitler joke last school year. This story, told by Jonathan Mahler, is especially sensitive to Frisch’s position and that of his supporters; the voices of those who initially called for Frisch’s removal — other than that of the Head of School Bo Lauder — are essentially silent. I wonder if those who initially were so upset about the remarks by Frisch have changed their minds, whether they were reluctant to go on the record at this stage, or whether another reason attaches. The hard over-arching question has to do with how to ensure free expression can thrive in schools while also supporting a diverse group of young learners effectively. It is just these questions that I sought to address in a book last year, Safe Spaces, Brave Spaces: Diversity and Free Expression in Education (free, open access edition here) . I won’t second-guess here the decision of another school, where I don’t know all the facts, but acknowledge instead that these cases are never easy for students, teachers, administrators, and families in close-knit school communities. We do need to get better at figuring out how to resolve them. I was intrigued by the emphasis in the article on the Quaker process. Both articles in the NYT Magazine demonstrate the importance of deep, long-form journalism to explore tricky issues in-depth. Good evening. Let me please begin by thanking Emily Ndiokho, Class of 2018, for her leadership tonight in MC-ing this event and also for her leadership throughout her time at Andover. As president of AfLatAm this year — in fact, the 50th president of AfLatAm — as a CAMD scholar, and all-around wonderful leader on campus, Emily deserves all of our thanks and praise. Let’s please have a round of applause for Emily. I am delighted to welcome all of you — Andover students, alumni, current and former faculty and staff, and honored guests — as we launch the celebration of the 50th Anniversary of the AfLatAm program. More than 300 alumni have traveled to campus to celebrate this milestone and—as importantly—to engage in discussions about diversity, equity, and inclusion at our school and in our society at large. I am particularly excited to hear tonight’s keynote address by Hafsat Abiola, class of 1992 and one of the very best speakers I’ve ever heard. We are all in for a treat tonight! I’d like also to take a brief moment to thank our colleagues who have worked so hard on this event. There are too many to name everyone, but in particular I’d like to acknowledge LaShawn Springer, CAMD dean; Linda Carter Griffith, Assistant Head of School for Equity, Inclusion, and Wellness; and Jenny Savino from the Office of Alumni Engagement. Their teams and colleagues have worked so hard to put this event together. I’d like to acknowledge also the support of our current and former Trustees, who stand behind and make possible all we do here at Andover, five of whom are here tonight: Gary Lee, class of 1974 and Allison Picoctt, class of 1988, who are current board members, and three former board members: Chris Auguste, class of ’76; George Smith, class of ’83, and Rejji Hayes ’93. Thanks to each of these trustees here tonight. Of course, when our founders codified these words in the Constitution of Phillips Academy in 1778, the ideal was far from our aspiration for today’s modern school. We don’t know exactly how Samuel Phillips and his co-founders truly defined “every quarter,” but they almost certainly meant white boys from local families. What we do know is that they likely envisioned a school that would admit sons of the working classes, not just the wealthy – they described it as a “public free school” and the very first class of students included a boy who traveled from Jamaica. Though our founders’ vision of the quarters from which youth might come to Andover would fall far short of what we embrace today, I believe that the real genius of those few words written down hundreds of years ago is their inherent challenge: that we should be “ever equally open.” This requires each new generation to strive to find students from every conceivable background as we seek to educate the future leaders who will change our world for good. Andover is a place—a vibrant, living community. But it is also an idea. And in both spheres—that of the real and that of the ideal—it is imperfect, always changing, always seeking truth. Nearly half of our students today receive financial aid. We are extremely proud to be the only school of our kind that is need blind. No other school can claim a financial aid program as comprehensive as ours. And it is the modern path by which we ensure access for all. These are important steps and we should be proud and grateful for the many people who have generously made it possible. Yet access alone is not enough. Diversity alone is not enough. These commitments are necessary, but they are not sufficient. A few years ago, we embraced at Andover a strategic plan that called for a renewed focus not just on diversity but on equity and inclusion. To lead our work in this area, Linda Carter Griffith – LCG to our students and families – began a new leadership role—the first position of its kind for independent schools—as Assistant Head of School for Equity and Inclusion (her title has since expanded to incorporate wellness). Linda’s work focuses on supporting all members of the Andover community so they can achieve their full potential. She brings the experience of a devoted teacher and seasoned administrator to this senior position at our school. Why is LCG’s role and work so crucial? From Ferguson to Baltimore, from Staten Island to Charlottesville, our country continues to struggle to come to grips with the enduring presence and legacy of white supremacy. From every vantage point, we must all look anew at the history and structures of our institutions and the degree to which we have an extraordinary amount of work to do. That includes at Andover. Each year, Andover welcomes more than 1,100 students to campus with as many distinct experiences and points of view. Emily and her fellow students come from nearly every state and 45 countries. In a world marked by global unrest and political discord, we rely on the principles of equity and inclusion to guide our thinking and actions. Linda’s leadership has been incredibly important to our community. Through partnership with the Community and Multicultural Development Office, student groups, and other faculty across campus, we’ve devoted ourselves as a community to probing matters of ideology, gender, identity, citizenship, and race. Guest speakers have challenged us on politics and policy; students have joined the #NeverAgain movement advocating for tighter gun control, #MeToo to advocate for gender equality and an end to gender-based violence, and a host of social justice activities. We can’t and we don’t shy away from those issues that challenge us to hear—and better understand—one another. I truly believe that this is how we will grow and learn as a community. Our commitment to equity and inclusion is fundamentally about keeping our promise to every student who comes here. It is our goal to ensure that everyone is valued equally and has an equal chance to thrive at Phillips Academy and beyond. I couldn’t be more excited about the young people at Andover today, nor more pleased with the strength of our faculty. Even as we remain deeply grounded in our founding values of 1778, in 2018 we are learning and growing as an institution in ways that directly benefit every student. Where does this lead us? Guided by our core values, Andover will continue to thrive and struggle and lean into tough issues — issues on which members of our community are bound to disagree. And I hope that each of you will play a pivotal role in this. This reunion, AFLATAM@50, is very much a celebration of our past—of student leaders who pressed us forward, of faculty and staff who worked tirelessly to address inequity—but it also is a commitment to the future and to the necessary, difficult, and extraordinarily important work that must still be done. I look forward to continuing on this important journey with all of you, with our faculty and our staff and our students. Thank you. Chris Hughes (Phillips Academy ’02), Fair Shot: Rethinking Inequality and How We Earn (St. Martin’s Press, 2018). 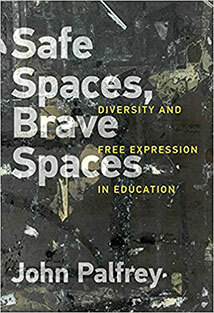 I also put out copies of the book I wrote, called Safe Spaces, Brave Spaces: Diversity and Free Expression in Education (MIT Press, 2017). We, the heads of independent secondary schools comprising the Eight Schools Association, stand in solidarity with our students and with the families of Marjory Stoneman Douglas High School in Parkland, Florida. We join with those voices demanding meaningful action to keep our students safe from gun violence on campuses and beyond. As many of our students have joined a nationwide movement to support the victims and survivors of gun violence in America, we pledge, as leaders of those schools, to help amplify their voices. Our students come from every state in this nation and from around the world to receive the very best care and education. We are moved to take action out of responsibility for the thousands of children in our care and out of compassion for children throughout this country. Each day of inaction chips away at every teacher’s right to deliver and every student’s right to receive an education free from fear and violence. We have given witness to Columbine, Virginia Tech, and Sandy Hook, among too many other instances of gun violence on campuses. Parkland is now added to that list. We as school leaders will do all we can in our power to keep our students safe. We call upon all those elected representatives – from each member of Congress to the President to all others in positions of power – to take meaningful legislative and regulatory action to make our schools safer for learning and teaching. It is hard to imagine any topic that would be more worthy today of our leaders’ focus. Do not let our students’ voices go unheard this time. Today, I wrote to the Andover community with an update on new and ongoing initiatives to ensure the safety and well-being of our students. My full message can be read online. Thank you, Dana Delany, for your kind introduction and for everything you’ve done for Andover over the years. I also want to thank Peter Currie and the board of trustees for their leadership. Most of all, I am grateful to all of you. Thank you for joining us as we launch this ambitious campaign to secure Andover’s future. With your help, we will make sure that Phillips Academy remains a vital source of both knowledge and goodness. We all have our own reasons for loving Andover. Maybe you had a teacher who unlocked your passion for science or poetry. Maybe you discovered an instrument or a sport that gave you a new sense of pride and confidence. Maybe you fell in love for the first time. Maybe, like Catherine and me, you placed your trust in Andover, to educate and care for your child. Each one of you here is proof of the results. So is Hafsat. Wasn’t she amazing? And in a few minutes you’ll hear from the incredible Kevin Olusola, whose musical and vocal talents found new creative pathways at Andover. There are thousands more stories like theirs—stories of lives changed by Andover, stories centered around knowledge and goodness. I think about the students the admission team assisted after Hurricane Katrina when they set up a makeshift office in a Houston hotel and conducted interviews by cell phone. One day these students are stranded, the next they’re headed to a promising new future. Alan Wesson was one of those 19 students who blew in on Katrina’s winds. He went from Andover to Yale and is now serving as director of public programs for a west coast high school’s Center for Civic Engagement. I think about Dario Collado, of the class of 1998, who spoke at All-School Meeting this spring. Dario grew up in a housing project in a working-class Dominican community in Lawrence. In an All-School Meeting last year, Dario gave one of those addresses where I could tell he had gripped every pair of eyes and ears in the audience. Dario told our students about how a teacher at the public high school saw his potential, encouraged him to apply to Andover, drove him to the interview, and even paid his application fee. I loved watching the faces of our students as they listened to Dario tell the story of how he found self-confidence and determination at Andover, how he became the first member of his family to go to college, and how he went on to a life of service nurturing the next generation of LatinX leaders. Dario’s story embodies our ethic of non sibi and youth from every quarter—and it’s a testament to the transformative power of the Andover experience for students from every quarter, from every socio-economic background, from all around the world. I think also of Caroline Lind, who came here as a promising student and devoted softball player from Greensboro, NC. When she broke her nose one season, she worked out on the erg to stay in shape. After hitting a record time on the machine, she changed sports and joined crew. We all know how this story turned out. Caroline went onto Princeton, starred in crew there, and has since won 2 Olympic gold medals. Circumstances, great coaching, faculty encouragement and personal “grit” enabled her to find a career and a passion. Your support has helped make all this possible. I’ve seen it first-hand over the past six years. You’ve allowed us to continue the need-blind admission policy so no student is ever turned away for financial reasons. No other secondary school has a financial aid program as comprehensive as ours. You’ve supported a legacy of excellence that shines most brightly in our faculty and academic program. It’s paying off: Last year, a record 86 percent of admitted students chose to enroll, joining us on campus just weeks ago. You’ve also supported our efforts to provide the healthy, balanced campus life our students need and deserve. I’m enormously proud of our state-of-the-art Rebecca M. Sykes Wellness Center and the programming and care to which it is home. You’ve helped us achieve so much. But we can’t rest on yesterday’s success. There are many more lives to change. Knowledge and Goodness, The Andover Campaign is our catalyst. Under the leadership of Peter and the trustees, and guided by the Academy’s strategic plan, we’ve set big goals – from ensuring that Andover remains need- blind, to building a dynamic campus that can support the needs of leading-edge 21st-century education. Our work is more important than ever. Andover’s mission—the charge laid down by our founders to instill both knowledge and goodness—is fiercely urgent and absolutely necessary. We are living in a time of great change… in education for sure, but also in our society at large… how we live, work, reason, and grow together… all of it is in flux. It can be disorienting… for students, for parents, for all of us. As someone whose research is focused on technological change, I see these effects on education every day on campus. I also see the impact of our increasingly polarized politics and how hard our students are working to keep open minds and open hearts. Here’s the good news: Andover is well positioned to thrive in this changing world—if we make the right choices and investments. That’s even more true today. Andover’s strength has always come from a special balance of continuity and change. Our traditions have defined us. Finis origine pendet is right there on our seal. But our spirit of innovation is what’s made us excel. Think of Thomas Cochran leading the way to build our modern campus in the 1920s, with our museums, library, and Chapel. Ted Sizer bringing coeducation to Andover in the 1970s. And Barbara Chase and Oscar Tang recommitting Andover to need blind 10 years ago, so that the Academy could live up to its promise of educating youth from every quarter. In each case, visionary leadership and courageous thinking helped Andover set the platinum standard for secondary schools everywhere. With Knowledge and Goodness, we’ll double down on Andover’s core values, which provide a foundation in a changing time—an enduring commitment to excellence and inclusion, an ethic of service and citizenship, and a laser-like focus on the minds and morals of our students. At the same time, we’ll keep innovating. The Tang Institute is an incubator for emerging ideas in education. Our faculty are already adding to their teaching techniques and changing the way students learn. Our Learning in the World program offers every student the opportunity to study off campus and experience a culture unlike their own. We are preparing global citizens like never before. I can’t think of anything more valuable in our present climate. And with your help, our need-blind admission policy will continue allowing us to recruit the most talented, creative and diverse student body in the country. This is what Knowledge and Goodness, The Andover Campaign is all about. It’s how we’ll make sure Andover continues to change lives for years to come. We like to say that the end depends upon the beginning. Well, this is another beginning for Andover. Right here, with all of you, tonight. Thank you for your support of our school, our students and faculty and staff, and the values we share. Thank you for all of it. Now let’s go change some lives!